Chloe has really been killing it lately. Its handbags this season are so on-point that it's all I can do to keep my credit card in my wallet when faced with their fabulousness. The Marti bags are a particular favorite. I am enamored with their sweetly feminine styling and edgy zipper details. 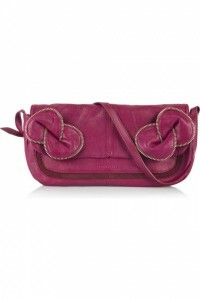 This Marti suede clutch is the perfect addition to an amazing line. This fuchsia color is completely spectacular. I would almost call it raspberry. It's got all the punch of hot pink, but it's toned down enough that carrying it won't make you feel like a neon-toting trendster. The merlot suede inserts add the perfect amount of contrast. I am really digging suede, lately, and the way it's used on the Marti bags is perfect. It doesn't look all shabby chic or boho, it just looks soft and touchable. Of course, it isn't as durable as leather, but it's not as though you'll be throwing your Chloe bag around all willy-nilly. The rounded front-flap design is youthful and on-trend, but definitely not trendy. And then there's the bows ... oh these iconic zipper-edged bows! I don't really dig bows, but they look so sculptural here that I just can't help but swoon. And as a major bonus, the Marti clutch is only $295! Seriously, this has to be a record low price for the Chloe line. Get in line, though, because these babies are gonna sell out fast. The Botkier Jaden Hobo, a larger, everyday, alternative to this bag.